We have an acre on our property that has bluebonnets. Unfortunately, it also has other plants that we don't want -Johnson grass, nettles, burrs. We plan to do a controlled burn in the fall and re-seed. Can we wait to grass seed in the spring or will we see uninvited seeds take root? We commend you for your intention to create an improved wildflower meadow. The Ladybird Johnson Wildflower Center web site has a number of useful tips for achieving your goal. It would be good to remove as many of the undesirable plant seeds this summer before they mature. Some are not destroyed by a controlled burn and will germinate in the spring. Wildflower seeds that you might want to add should be distributed in the fall. Many of them will germinate with the (hopeful) fall and winter rains and be well rooted by spring. Native grasses can be planted in the winter also or in early spring. It might be more convenient to plant grass seed in the fall along with the wildflowers. It is important for the seeds to have direct contact with mineral soil. This should be easily done on the burned field, especially if you drag a rake or chain over the area to help drop the seed down onto the soil. You can purchase seeds from local nurseries. Some, e.g., Native American Seed, have a number of mixtures of grasses and forbs well suited for your area. 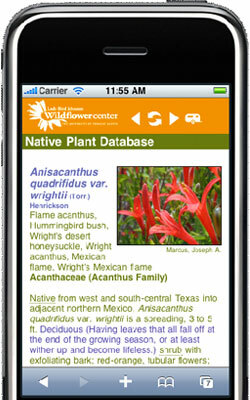 Information on individual grass species is available on the Lady Bird Johnson Wildflower Center web site Native Plant Database by typing in the plant name. On this web page you can also find the recommended plant species for your area. I attach below images of some of the most common native grasses for central Texas. September 17, 2008 - I live N of Ft Worth,Tx is there a trick to digging up & transplanting hackberry trees?